You may have seen the mystery seeds from last week when you pitted an olive. 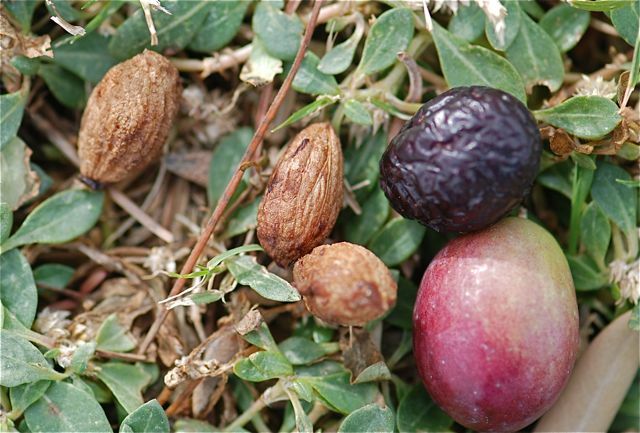 The ones in the photo were lying on the ground under an olive tree, Olea europaea. 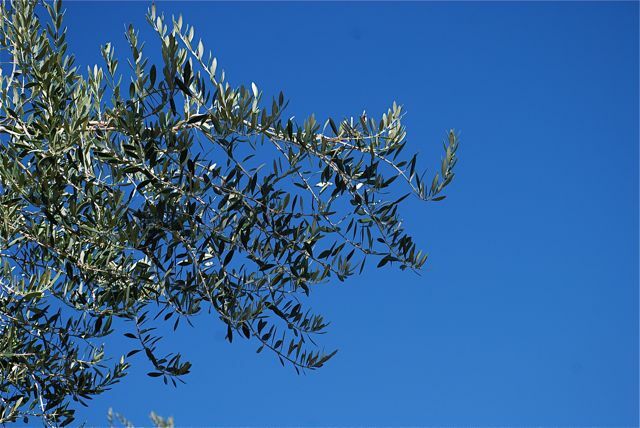 Olive trees are originally from the Mediterranean region, where much of the world's olive oil production still occurs. 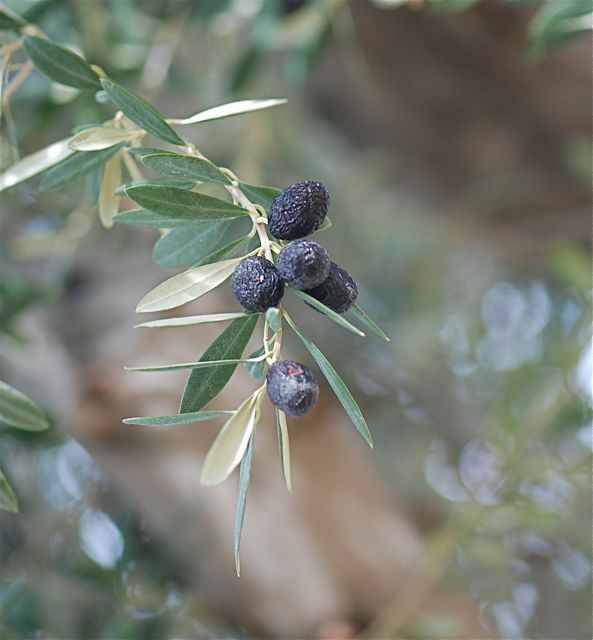 In the United States, olives grow in California and Arizona. Olives are small trees, sometimes with multiple trunks. 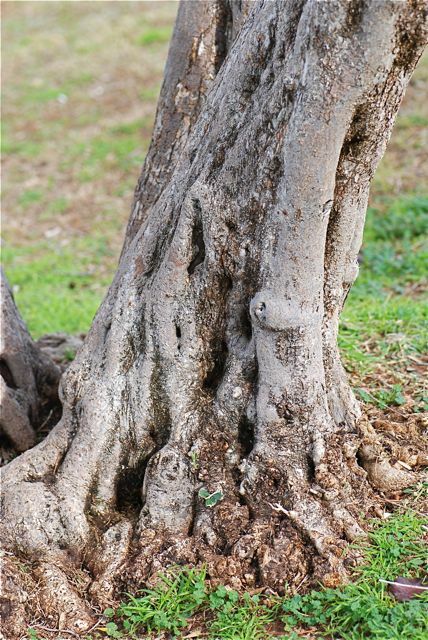 The trunks of older trees are often gnarled and twisted, giving the trees and interesting look. The leaves are a lovely greyish-green. The flowers are greenish-white and are pretty much inconspicuous. Olive pollen is a known allergen. 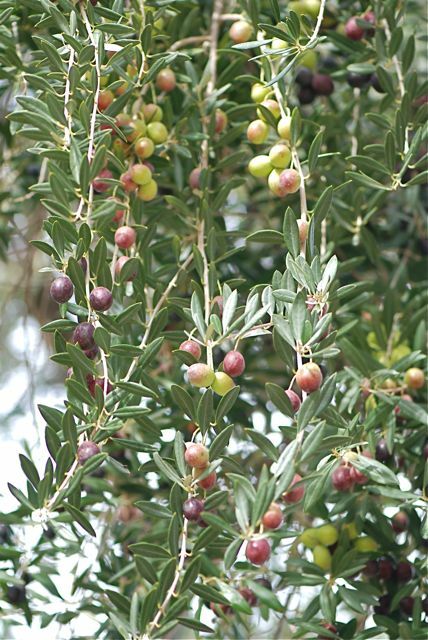 Here in Arizona a sterile variety of olive (that doesn't produce pollen) has been developed for those who simply want to use the tree for ornamental purposes. Over time the fruit turn black and drop off the tree. Many newcomers to Arizona see the olive fruit and wonder if they can eat them, but olives straight from the tree are not edible. The fruit needs to be leached in salt and vinegar and then processed before it is good to eat. Or the fruit can be processed into oil. You can grow olives from the pits, but of course the new plants won't necessarily resemble the parent tree. Botanists have tricks to weaken the hard pit and increase the chance of germination, such as gently cracking the surface. All this talk about olives has made me hungry. Maybe it is time for an egg salad sandwich with olives. Do you have a favorite way to eat olives? Any way I can! Love olives! Everyone in the family does, except the husband. Not green. Not black. He says their flavor will ruin anything they are put in! Can you imagine??? Hi, I have recently moved to Arizona and there are several trees right down the street from me with ripe olives. I would LOVE to cure/process them (with permission of course!) but I cannot figure out what type of tree it is. The tree is EXACTLY what you show in your photos. What kind is this? Also, they are ripe when they turn dark and are falling off the tree, right? Because the birds are loving them right now, so I assume they are ready. Any information you could provide would be so helpful, as this is the first site I have come across with photos of the same tree! 🙂 Thank you! 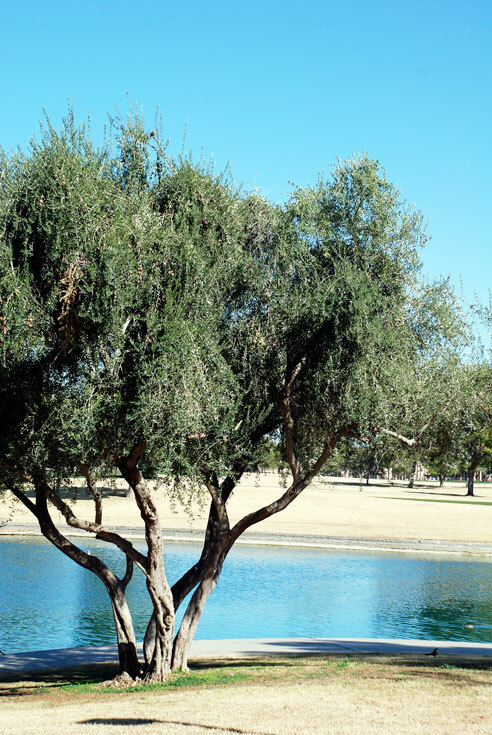 Olive trees are quite common around Phoenix and Tucson. There are a couple of different cultivars of the European olive that grow here, but I don't know which cultivar the trees in the photograph are. They are growing in the landscape at the park next to Dobson Library. Here's a bit of history about trees on campus in Tucson: http://arboretum.arizona.edu/university-arizona-olives . In any case, if you are interested about finding about olives and how they are processed, I would suggest calling or visiting your local Cooperative Extension Office. Processing olives is actually quite complicated, which is why you see so many left lying around. If you are interested in olives, have you been to the Queen Creek Olive Mill yet? Good luck with your interest. how i can seek the seed of olive?